The Apple brand, like the Disney brand, or even Scientology, is not just a product. These brands are regarded as a religion by their fans. In a previous blog post I commented on how Microsoft ignores it's own customers and tries to tell them what they will like. Apple does something different. It gives the customer what they want, as evidenced by all the excitement every time a new Iphone comes out. But then it totally uses it's customers once they are inside Apple's "gated community." If Microsoft's Windows platform might be too rambunctious and open then Apple products are the opposite. And, like an abused girlfriend, Apple customers keep on coming back for more. Apple phones are a bit pricey but, thanks to mass production, they are still competitive. 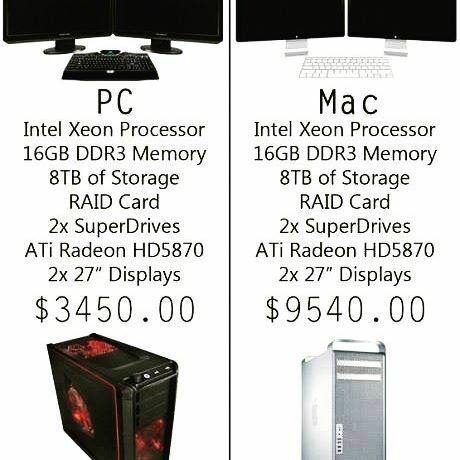 Mac computers, however, are pointlessly expensive. Just look at the comparison at right. A Windows machine is $3,400 and the similar mac is a whopping $9,500! And they have the same capabilities because there is no "must have" program that only runs on Macs. Some of my clients have been burned because they bought Mac laptops when they had more money and the economy had not yet collapsed. Now eight years later the thing is breaking down and they can't afford the many thousands of dollars it would take to replace them. I got a cheap Windows laptop for $400 once but Mac users have an investment in software and accessories that makes it hard for them to switch brands. 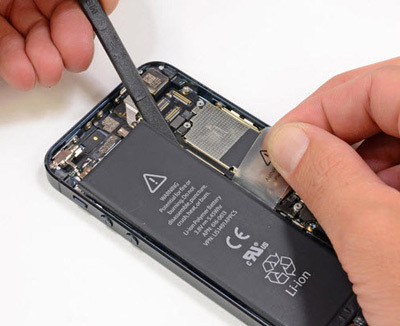 Apple has already been criticized even by fans as having inadequate warranties. Decades ago they boasted that their Apple ][ and Mac computers were well made yet they gave only a three month warranty. Magazines at the time like MacWorld and MacUser railed for years over these bad warranties. A magazine is a thing made of paper and you turn pages in it. It's like a tablet that gives you paper cuts and ink stains. 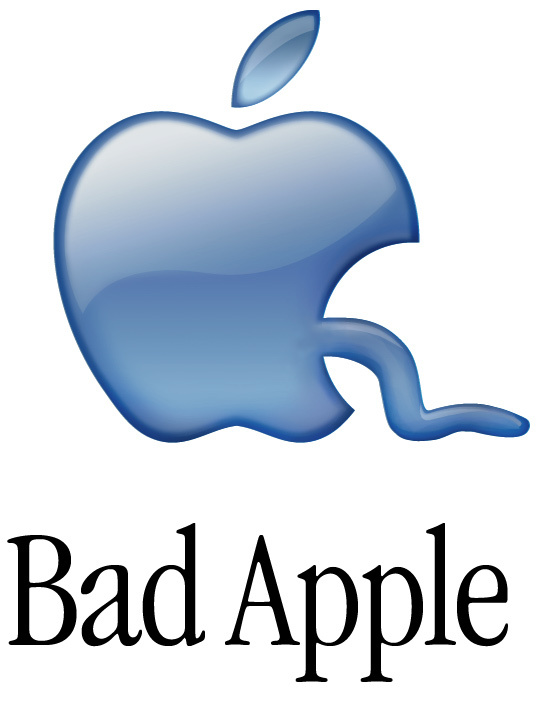 In 2012 Apple had to stop selling Applecare in parts of Europe due to warranty problems. And if you buy your Apple product at a non-Apple store the warranty is not activated by default. If you buy the same thing at the Apple store the activate your warranty at the time of purchase. Some also suspect that their phones are built only to last slightly beyond the warranty period. After that something is likely to wear out or break. Where I live in the Hollywood/Beverly Hills area there are several Apple stores and they are almost always vibrant, busy places where customers obviously enjoy going or the would not be seen there in such numbers. Sony and Microsoft both tried retail stores like this and flopped terribly. They just didn't get retail like Apple does. Unfortunately some of the crowds waiting there are in line to pick up repaired equipment. Often waits can be long at the "Genius Bar" or even to talk to an employee. There are just so many people there asking questions or using computers for free. And just because you have made an appointment does not mean they will be able to see you at the scheduled time. Best thing to do is go early the first hour that the store opens. Another reason for the crowds is that Apple makes it's computers in such a way that only the Apple Store can repair them properly. See below "Why Apple products are hard to open." Apple store workers are religiously devoted and put up with the difficulties because they adore the company. Competition is great for jobs at the stores which means Apple does not have to pay them that much and there is very little opportunity for advancement. Some of my Apple clients enjoy going to the Apple store while others consider it a fate worse than death. The Mac OS is known for constantly bombarding it's users with password requests. While that might be better security it is not very hard to bypass the passwords. They mostly keep the cleaning lady or the kids out of your computer. But even if someone just wants to download an update to Mac OS (as is their legal right as a purchaser) they still have to log onto the Itunes Store, type in their name and password and make sure they have a credit card on file even if the software they want is free. It makes it difficult to spend money on their offerings and I've seen it leave my clients furious that they can't get something done because they don't remember passwords and logon names. In conclusion there are both benefits and drawbacks to Apple's closed system. Some people like to live in gated communities and some don't. There is no right answer, but remember that once you chose Apple you are under their control. If you live in a rural area the nearest Apple store could be hours away by car. Apple products are like a gated community while Windows computers are so open they can be rambunctious and insecure. One is not better than the other they are just different. Before the invention of the Apple Store Apple's hardware was designed to be easy to open. But once they controlled their own repair facilities they began designing computers to deliberately look great but be hard to open. This also stabbed long time mom and pop Apple authorized repair centers in the back. Now you need to take it to the Apple store for service. Just check the bottom of one of their beautiful laptops. It is great looking smooth aluminum. No ugly screws to make it easy to open! Apple invented something called a "pentalobe" screwdriver to make their products tamper resistant. Yes, they invented their own screwing system to screw the consumer. For a year Apple had a monopoly on a screwdriver! Pentalobe screws have been used by Apple since 2009, when they were first implemented in the 15-inch MacBook Pro. They have since been used on other MacBook Pro, MacBook Air and iPhone models. Apple attracted criticism upon the introduction of the pentalobe screw; it was seen as an attempt to lock individuals out of their devices. If brought in to an Apple Store for repair, iPhone 4 models with #00 Phillips screws, if any, are replaced with 0.8 mm pentalobe screws. Third-party manufacturers rushed to produce screwdrivers that would remove 0.8 mm pentalobe screws after the iPhone 4's release in June 2010. Trying to remove a pentalobe screw with the wrong screwdriver will strip the screw making it unremoveable. And when you take your laptop or phone in to be repaired at the Apple Store I guarantee there is some poor slob in back surrounded by crazy screws and lots of them. Apple deliberately uses glue instead of screws too often. Or their products have too many screws, tiny screws, weird non-standard screws, require special suction cups to open, or have customized internal organs that are Apple-only. It makes it hard for me to repair them which is just what Apple wants. All too often I have had to tell laptop owners "Just take it to the Mac store and pay though the nose." This also makes their products hard to recycle. RAM, the memory computers use for temporary storage, is often soldiered directly to the motherboard by Apple. This means you can't increase your laptop's memory once it leaves the factory. And the laptop's display may be fused into a solid piece. This means that if ANYTHING goes wrong with the screen the whole upper half of the laptop must be replaced as a unit. Iphone and Ipad screens are similarly fused making their replacement complex. This was done to make the phone slimmer and harder for outsiders to open. Even worse, Apple goes out of its way to make SURE replacing their batteries is a hassle. FACT: batteries wear out after a few years and MUST be removed and replaced. Unlike my Android phone from Samsung, Apple phones cannot be opened by consumers. Apple wants to be the ones to swap out the battery. Its an attempt to get you to just buy a whole new phone when the old one's battery dies. And not only are Macbook laptops hard to open, once you get inside you may find that the battery you are trying to replace is glued to the system or soldered in place! And taking that laptop to the Apple store for a new battery will set you back $400! It turns out, in modern Mac laptops the battery isn’t just a battery. In a quest to make machines thinner, Apple made the batteries unserviceable by the user (as well as removed much of the protective covering). The battery is glued to the bottom of the keyboard which means they have to replace both at the same time (even if your keyboard works just fine). It could also take three days to get the computer repaired. Yes, three days to swap a battery. Three days to repair something on a Mac laptop that every Mac laptop is supposed to need done before the machine fails. The battery is rated to last less than the machine for most users. Nearly everyone who buys a Mac laptop should need to replace the battery (unless they are programmed to constantly upgrade). Why? Well it turns out that battery is not just attached to the keyboard, but also the logic board which controls a lot of the computer. A very difficult repair I'm told. So in Apple's insane quest to get laptops a few millimeters thinner, a standard repair like a battery swap takes 3 days. Now it turns out that it doesn’t actually take 3 days, its just the line is really long and it does apparently take several hours per machine. Don't believe me? For more info read "Apple's Diabolical Plan to Screw Your Iphone."